… then head over to this thread on Jennifer Marohasy’s blog and read the comments, starting from #1 [warning, not suitable for the kiddies, and be prepared to sip a Pan Galactic Gargle Blaster after the experience]. Me – I’m barracking for Luke, SJT and PeterW. You’ll find similar stuff in the comments at half a dozen other non-greenhouse theorist blogs. It’s certainly a good warm up to Denial vs Good Science Part III, which I’ll post tomorrow soon. 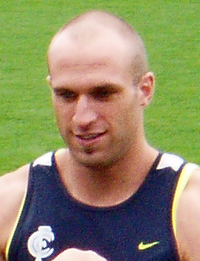 Oh, and just thinking, if hair is a necessary qualification for aptitude, then it is amazing that Chris Judd can even hold a footy! And I wonder what Steve Schwartz would think of those comments about my Alma Mater! I’d like to thank Luke for hanging in there. It’s dirty work but somebody has to do it. Often associated with that anti-greenie-lefty obsession (Ra syndrome) is a fascination with guns. I think you’ll find that “Ra” is Joe Cambria. He’s angry because he got banned here. My 93 year old mother is a climate scientist too because she has experienced a lot of weather/climate. She is very much a skeptic of the AGW bandwagon which she subtly describes as simply mind over matter not mind out of matter. Hey, nice find Molnar – I’m in august company! Could you please explain to readers what you find incorrect with the comments there as the overriding arguments seem to be that you have no formal qualifications in climate science, present pretty extreme views on mass extinctions and that you do blogging by bibliography. Are any of these assertions incorrect? Would be very interested in your views. Re: who is, and isn’t qualified to post on climate science – I’ll blog on that very point soon. Barry – since I shaved my head I find I get more space on the bus, get through supermarket checkouts quicker and little children now leave me alone. Plus the increase in albedo from foliage clearing results in cooler processing of all manner of worldly problems. A local land management feedback effect. In fact I calculate a significant reduction in the Earth’s albedo could achieved if the entire planet became bald. So hat tip to you for again showing us the incredible innovative potential of personal climate realism. Anyway can’t chat – being an ex-grant ho – I have to go and pimp a grant application for my theory. Betcha CSIRO flagships haven’t thought of this one. Thanks for the thought Barry. I can’t stand that kind of humourless crap – I despise those who turn interesting conversations, no matter how adversarial, into nasty spiteful throat grabbing brawls. Attack at will ‘with plenty of smoke’, but with subtly and style I say. Well, at least I try… though I have to confess to fixing a bayonet every now and then and usually regretting it later. I guess that we can’t throw off all our ‘basic training’, even with the passage of many years. I did promise to engage someone (I think it was Bernard) over a post he linked to but I’m sorry to say I’ve forgotten what it was all about – remind me if you like B. Too much work to do, too little time and too few people with the skills and inclination to put in the hours these days. Perhaps Kevin 747 during one of his rare visits to Australia can engineer another Labor recession and create a climate (sorry) in which jobs are worth more than ‘jet ski time’ in Ocean Grove. I enjoy visiting blogs like this one from time to time though, it’s stimulating and helps clear the stultifying mental moraines that project management can build. However – you were waiting for the however weren’t you? However as I suspected my trip to the hinterland gave you the opportunity to pile on the superlatives and forecast the end of the world with ever increasing dash. I might have mentioned before (lifts shield to deflect fruit) that proponents of the worst possible outcomes of the religion of AGW can’t help themselves from launching the most preposterous claims onto the most hopeless trajectories and bearings and wondering why the ‘bomb damage reports’ show that not a single round was on target. Their (your) propaganda projectiles aren’t deflected by gravity, air resistance or wind, but lack of sufficient propellant (credibility), poor ‘barrel temperature monitoring’ (understanding of public inurement to message) and absolutely no understanding of ‘deflection’ (the information cycle). It causes concern (deeply felt I’m sure) and yet another ‘repeat’ mission to be fired onto a target long since re-positioned, able to absorb the barrage and return effective fire. So, have your missives raised the concern of the average punter? No, not really, the Olympics might be over but it’s footy finals’ time and before you know it Santa will be ringing his bell in every Myer and David Jones store across the country. So post away I say, your aim is obscured by smoke, your firing tables are mismatched and your bearings are deflected by inadequate models and extraordinary claims repeated and embellished so often as to cause immeasurable ‘barrel wear’ and your rounds to fall short and wide. The gut trembling rumble I sense you feel in your intellectual bones is a corps of sceptics, re-armed, rested and rolling down from the high ground with pennants streaming and the battle cries of “hoax” and “death to the carbon tax” ringing across the field. 108 Field Battery adjusting (my old favourite). Shell – ‘logic, scepticism and pragmatism’. Battery – one round adjusting, division 20 rounds for effect. PeterW, thanks for making clear that much of the denialism mindset is objective and science based (snicker). Oh that’s right – AGW ‘tipping-pointism’ is "objective and science based…"
BTW – Macquarie Uni is listed at number 7 in the 2008 rankings of Aust. unis – ahead of Monash and Adelaide who are both part of the Group of 8. Therefore it is considered a top research uni – and incidentally it’s graduates are listed as the highest paid of any newly graduating students. Ha, nice catch re: Plimer’s PhD, SP. Macquarie Uni have got a very strong geology Dept and Sue O’Reilly just won a major prize. For those like Hissink who just can’t stand the suspense, yes, I did my undergrad at MU too – I chose MU over USyd or UNSW because it was the only Sydney-based Uni that did a full palaeo- degree + let you combine computer science with Earth/Env science (the two Go8 uni’s had an overly rigid course structure). I did my PhD at MU because my supervisor was the top of his field – so why move to secure a lesser advisor? Ahh, the pointless games the denialists try to play. As I’m regularly the target of the ‘denialist’ slur I thought I’d make a comment about academic snobbery. I couldn’t give a rat’s where Barry studied; neither would most of us outside ‘the club’. For some reason there is a pettiness in academia, red brick versus sandstone, Melbourne versus Monash, it’s incomprehensible really. I regularly collaborate with people I’d describe as being scientists according to my simple definition. I tend to only work in the private sector and I just assume the companies employing the scientists I meet have done so because they can do their jobs well, not because their degree is a ‘better one’ than so and so’s. It’s that ‘economic imperative’ thing again. The only people I’ve heard use such resentful remarks about qualifications are the same ones who when interviewing me for a ‘job’ often ask what education I received 40 years ago. I find this to be a trivial exercise as it’s always my body of work which caused them to invite me to tender for the contract in question in the first place. Whether I was trained to use rubber cement friskets and rotring pens in Melbourne, Sydney or Perth last century seems as irrelevant to me as where Barry chose to acquire his qualifications – it’s his body of work which is important. Sadly it’s usually people involved in administering educational institutions who are the most frequent offenders in my case. I might add I haven’t touched a rotring pen since around 1988 – I’m cursed with being an ‘early adopter’. This kind of imperious snobbery is especially strange coming from “scientists” who should know that the correct measure should be the quality of the work. Anyway… Sandstone Uni or no, they are all prepared to bend with the market. Witness the large number of Bachelor of CSI courses that have sprung up in recent years! Got a course with falling attendances. Re badge that course as a “forensic” course and watch enrolments soar! So just who does climate science?